The Rev. Dr. Kieth A. Gerberding was born on December 6, 1935, in Decatur, Indiana, to Arnold H. and Luella (Lapp) Gerberding and was baptized at Zion Lutheran Church in Decatur, Indiana. His formal education began at Concordia Academy and Junior College in Fort Wayne, Indiana (1949-1955). Preparation for the Holy Ministry took place at Concordia Seminary in St. Louis, Missouri. At the seminary, he earned a B.A. (1957), a B.D. (1960), a S.T.M. (1961), and a Th.D. (1972). On June 21, 1958, Rev. Gerberding and Joanne S. (Mathiak) of Detroit, Michigan, were united in holy matrimony. Their marriage was blessed with three children: Susan M. Gerberding; Michael L. Gerberding, wife Kym, and son Michael; and Timothy M.. Gerberding, wife Margaret, son Kieth and daughter Joanna. Rev. Gerberding began his ministry as Parish Pastor in Carrollton, Illinois, from 1961 through 1964; served as Instructor in Biblical Studies at the University of Texas in Austin, Texas (1964-1967); and then accepted a Call to become Campus Pastor at the University Lutheran Church at University of Indiana in Bloomington, Indiana. For 30 years, Dr. Gerberding was Parish Pastor of Peace Evangelical Lutheran Church in Southgate, Michigan (1971-2001), until his retirement. 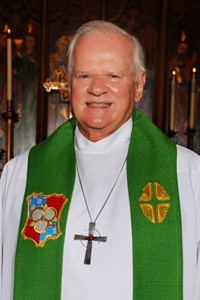 In November of 2001, he accepted the position of an Assisting Pastor and member of the pastoral team of the Cathedral Ministry at Historic Trinity Lutheran Church in Detroit, Michigan. During his ministry, Rev. Dr. Kieth A. Gerberding published various books. His writings include various exegetical studies, sermons, articles and reviews published by the Concordia Theological Monthly, Concordia Pulpit, The Lutheran Witness, Lutheran Libraries, and Currents in Theology and Mission. He is an accomplished Bible Class Teacher and a gifted Musician and Soloist.